The male pileated woodpecker may not have the most sophisticated sense of rhythm, but he's a stylish drummer nonetheless (Photo: ucumari, Creative Commons license). The holiday soundtrack, which retailers now begin to cue up before the Thanksgiving dinner plates have been cleared from the table, has a limited playlist. Even though the variety of artists covering these tunes is diverse, it doesn’t take long for the music to become little more than background noise. However, there’s one tune that always snares my attention—instantly I’m transported back in time to another Christmas… to a crisp, sunny afternoon on a favorite trail at the Houston Arboretum and Nature Center. That day, the sound of a tree-house being constructed high above my head caused me to glance up, and I caught my first thrilling glimpse of a not-so-little drummer boy. 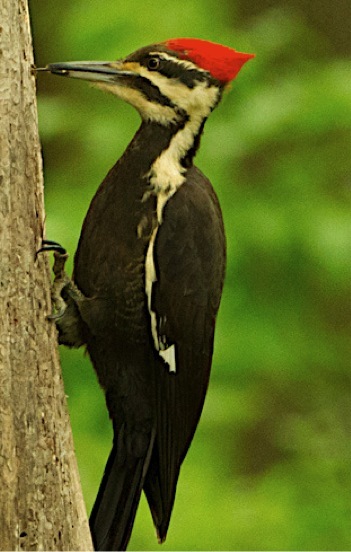 The female pileated woodpecker doesn't have the red forehead and "mustache" of her male counterpart. About the size of a crow (16-19 in. or 40-49 cm), the pileated woodpecker (Dryocopus pileatus) is North America’s largest woodpecker (unless ornithologists can prove that ivory-billed woodpeckers (Campephilus principalis) still exist). At first glance, one might reasonably doubt my ability to determine that this was, indeed, a drummer boy. Adult pileated woodpeckers are easy to identify, but unless you look closely they don’t appear to be sexually dimorphic (males and females of the same species differ in appearance). But I was close enough to see the telltale signs of a male bird—a red forehead and “mustache” to go with the pointy scarlet gnome hat sported by both genders. Since that first lucky holiday outing, I’ve had the good fortune to see many other pileated woodpeckers, but it’s always a bit of a jolt to the system. Perhaps it’s the combination of size and pointed head, or maybe its the wing-beat pattern during flight, but there’s something eerily prehistoric about this bird. Imaging you are ambling down a wooded path, enjoying the great outdoors but allowing your mind to wander where it will… when out of the corner of your eye your subconscious spots a pterodactylus! It takes only a second or two for your conscious brain to recognize the error, but not fast enough to prevent your adrenal glands from springing into action, bathing your reptilian brain in fight-or-flight chemicals, turning your heart into a percussion instrument. Human drummers display a assortment of styles—Afro-Cuban, blues, jazz, zydeco—and the same can be said for the avian set. But there’s not a lot of subtlety to a pileated groove. You can break the beat down into two sets—drumming and tapping. To my ear, the drumming sounds most like an enthusiastic, albeit novice, carpenter: pound furiously for 2-3 seconds, less forcefully as muscles quickly tire… rest for a minute… bash the next nail for 2-3 seconds… repeat. Tapping, which is slower and metronomic, often serves as a form of mated pair communication. Looking for signs of pileated woodpeckers in your neck of the woods? It helps to live on the eastern side of the continent, although you can find them across much of Canada and down along a fair bit of the western U.S. coast. This species doesn’t migrate, and once a pair has established a breeding territory they defend it year-round (although they’re a little more relaxed about it during the winter months). So, assuming you’re in the right neighborhood, the next step for spotting this hammer-head is to look for squares. I’m not suggesting these rakishly attired birds aren’t hip—just that they have a stereotypic method of excavating the carpenter ants and wood-boring beetle larvae they like to eat. 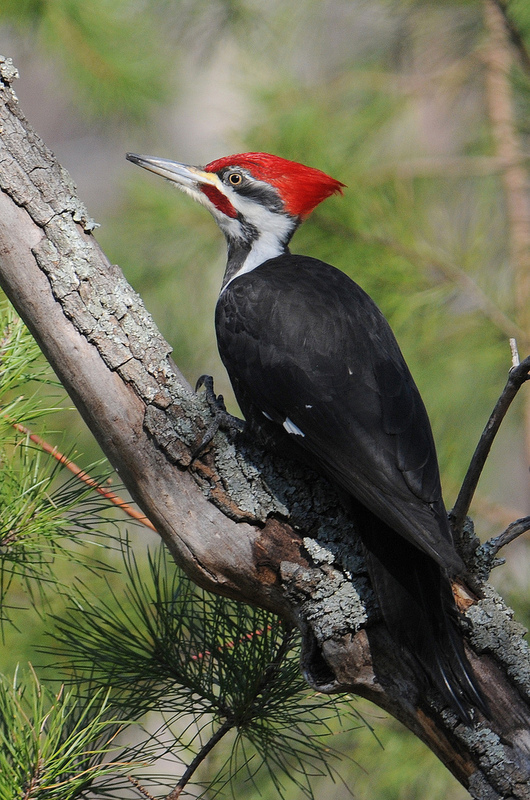 Unlike many other woodpeckers, pileateds don’t waste time drilling a succession of small holes into tree bark. They gouge out large, roughly rectangular chinks instead; a practice that can be quite damaging to small trees, but it’s beneficial to other bird species who come along and feed on left-overs after the bigger bird has flown the coop. 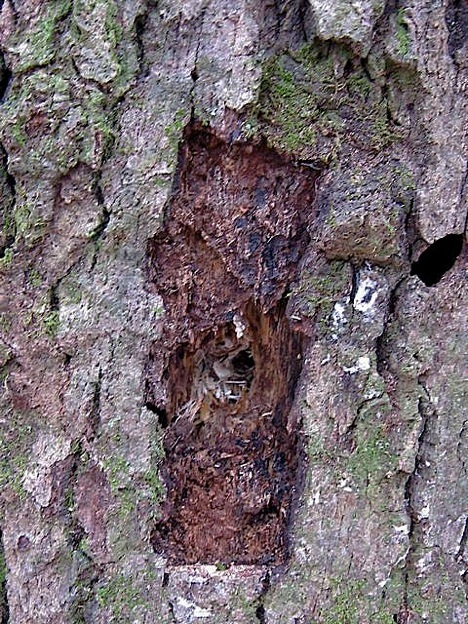 Pileated woodpecker nest cavities usually have more than one entrance. Pileated pairs share child-rearing duties, and they prefer to use a different nursery for their offspring every year. That means each April the male carves a new nesting hole, leaving last-year’s crib vacant for other cavity-nesting creatures to use for many years to come. 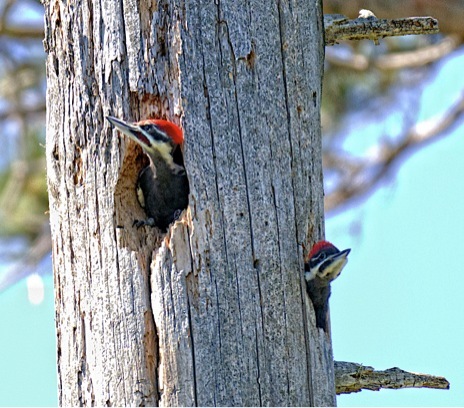 Biologists don’t really understand why some species exhibit nest site fidelity while others do not, but in the case of the pileated woodpecker, this philanthropic service improves the overall health of the ecological community. All drummer boys—and girls—have a knack for gift-giving, it seems. © 2011 Next-Door Nature—no reprints without written permission from the author (I’d love for you to share my work; all you have to do is ask). Thanks to these photographers for making their work available through a Creative Commons license: Syd Phillips (female pileated); Naomi Van Tol (pileated foraging sign); and Larry McGahey (nestling pileateds). Thanks also to Marty Stouffer’s Wild America Sound Effects Library for making the recording of a pileated woodpecker’s call and drumming available through a Creative Commons license. This entry was posted in behavior, birds, clues and signs, Habitat, natural history, nesting behavior, pileated woodpecker, woodpeckers and tagged animal behavior, backyard wildlife, beak adaptations, Biology, bird behavior, birds, feeding strategies, Nature, pileated woodpecker, postaweek2011, suburban wildlife, urban wildlife, watchable wildlife, wild birds, wildlife, woodpeckers by Kieran Lindsey. Bookmark the permalink. He’s a beautiful bird, no mistaking him that! I loved hearing the “drum roll” at the end of the track! Novice birders love the pileated for that very reason–a positive ID is as easy as opening your eyes! one of the thrills of my life was spotting a pileated woodpecker’s nest some years ago. I sat for an hour or so watching and listening, came back the next day and sat again. Look up, look way up…. It always comes as a surprise how BIG they are, doesn’t it? Any time I see a woodpecker dancing up and down the trunk of a tree, I wonder what it would be like to REALLY live in three dimensions LOL! heh heh. I was surprised at how loud the baby ones could chirp. That’s how I found them, by following the sound of the racket they were making. where do I download these sounds? You should be able to just click on the imbedded player and listen. I’ll check to make sure the link isn’t dead or if there’s some other technical problem.